The overall shape and position of the heart may vary according to the relative size and orientation of each of its parts. For example, a large right ventricle may allow exposure of only a short segment of aorta; this is because of the narrow confines of the middle mediastinal space. The right auricle is separated from the right atrium by a shallow posterior vertical indentation on the right atrium (ie, the sulcus terminalis) and, internally, by a vertical crest (ie, the crista terminalis). The crista terminalis separates the right atrium into trabeculated and nontrabeculated portions. Congenital anomalies of right atrial components can be associated with clinically significant cardiac malformations. For example, in patients with tricuspid atresia, the eustachian and thebesian valves may be so enlarged that they physically separate the right atrium into 2 distinct sections. Other variations include juxtaposition of both atrial appendages and malpositioning of both appendages. 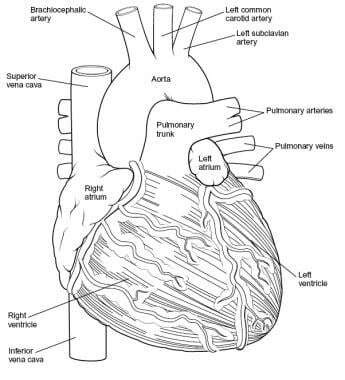 The 4 pulmonary veins drain into the left atrium. The flap valve of the fossa ovalis is located on the septal surface of the left atrium. The appendage of the left atrium is consistently narrow and long; recognition of this appendage is the most reliable way to differentiate the left atrium from the right atrium. The left atrial appendage is the only trabeculated structure in the left atrium because, unlike the right atrium, the left atrium has no crista terminalis. The right ventricle receives blood from the right atrium across the tricuspid valve, which is located in the large anterolateral (ie, sinus) portion of the right ventricle. The right ventricle discharges blood into the pulmonary artery across the pulmonic (semilunar) valve located in the outflow tract (infundibulum). The inflow tract (sinus) and outflow tract (infundibulum) of the right ventricle are widely separated. Internally, the sinus area and infundibulum contain coarse trabeculations. The septal portion of the right ventricle has 3 components: (1) the inflow tract, which supports the tricuspid valve; (2) the trabecular wall, which typifies the internal appearance of the right ventricle; and (3) the outflow tract, which itself is subdivided into 3 components, namely, the conal septum, septal band division, and trabecular septum. Of these 3 subdivisions, the conal septum is clinically significant because it can be malpositioned in patients with congenital disorders (eg, double outlet right ventricle). Lateral to the conal septum, the parietal extension of the infundibular septum and the infundibular fold comprise the crista supraventricularis. Ventricular septal defects (VSDs) commonly occur in the area between the sinus and the outlet tract of the right ventricle. However, because the surface of the right ventricle is trabecular, small defects of the muscular portion of the ventricular septum may be difficult to see. The tricuspid valve is supported by a large anterior papillary muscle, which arises from the anterior free wall and the moderator band, and by several small posterior papillary muscles, which attach posteriorly to the septal band. The left ventricle receives blood from the left atrium via the mitral (ie, bicuspid) valve and ejects blood across the aortic valve in the aorta. The left ventricle can be divided into 2 primary portions, namely, the large sinus portion containing the mitral valve and the small outflow tract that supports the aortic (semilunar) valve. Inflow and outflow portions are closely juxtaposed, unlike in the right ventricle, in which the tricuspid and pulmonic valves are widely separated. The aorta begins at the base of the heart and typically branches to form the coronary arteries just distal to the aortic valve. In patients with cardiac malformations, the aorta almost always can be identified by tracing it back from the brachiocephalic arteries, which only very rarely originate from the pulmonary artery. The main pulmonary artery branches into the pulmonary arterial system. In patients with aberrant cardiac anatomy with a patent ductus arteriosus, accurate identification of the pulmonary artery can be difficult using angiography, because the pulmonary artery becomes opaque during aortic injection. To differentiate the pulmonary artery from the aortic valve, remember that the pulmonary artery almost never gives off brachiocephalic branches. The ventricular septum is divided into a muscular section (inferior) and a membranous section (superior). The muscular portion makes up the left and right ventricular walls. The membranous septum, also termed the pars membranacea, is a fibrous structure partially separating the left ventricular outflow tract from the right atrium and ventricle. 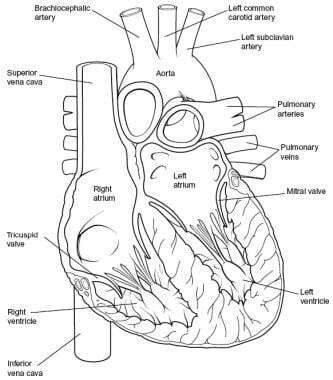 The atrioventricular (AV) septum, located behind the right atrium and left ventricle, is divided into 2 portions: a superior portion (membranous) and an inferior portion (muscular). Inside the left ventricle, the muscular component makes up part of the outlet septum. The AV node lies in the atrial septum, juxtaposed to the membranous and muscular portions of the AV septum. The spread of electrical activation from the sinus node extends toward the AV node via Purkinjelike pale cells in atrial muscle bundles. Anterior, medial, and posterior interatrial conduction pathways arise from the SA node. The anterior and medial pathways are located anterior and posterior to the foramen ovale; the posterior pathway is situated caudal to the foramen ovale. The AV node is situated directly on the right atrial side of the central fibrous body in the muscular portion of the AV septum, just superior and anterior to the ostium of the coronary sinus. Measuring approximately 0.1 cm x 0.3 cm x 0.6 cm, the node is flat and oval. The node's left surface is juxtaposed to the mitral anulus. The AV node continues onto the His bundle via a course inferior to the commissure between the septal and anterior leaflets of the tricuspid valve. The bundle follows a course along the inferior border of the membranous septum and, near the aortic valve, gives off fibers that form the left bundle branch. The His bundle is located on the left side of the ventricular septum in 80% of patients. In the 20% of patients in whom the bundle is on the right side of the septum, the His bundle is connected to the left bundle by a narrow stem. The left bundle branch further subdivides into several smaller branches that begin at the ventricular septal surface and radiate around the left ventricle. The right bundle branch originates from the His bundle near the membranous septum and courses along the right ventricular septal surface, passing toward the base of the anterior papillary muscle. The AV valve of the left ventricle is bicuspid. The AV valve has a large anterior leaflet (septal or aortic) and a smaller posterior leaflet (mural or ventricular). The anterior leaflet is triangular with a smooth texture. The posterior leaflet has a scalloped appearance. The chordae tendineae to the mitral valve originate from the 2 large papillary muscles of the left ventricle and insert primarily on the leaflet's free edge. The AV valve of the right ventricle has anterior, posterior, and septal leaflets. The orifice is larger than the mitral orifice and is triangular. The tricuspid valve leaflets and chordae are more fragile than those of the mitral valve. The anterior leaflet, largest of the 3 leaflets, often has notches. The posterior leaflet, smallest of the 3 leaflets, is usually scalloped. The septal leaflet usually attaches to the membranous and muscular portions of the ventricular septum. A major factor to consider during surgery is the proximity of the conduction system to the septal leaflet. The membranous septum lies beneath the septal leaflet, where the His bundle penetrates the right trigone beneath the interventricular membranous septum. Moreover, the portion of the septal leaflet between the membranous septum and the commissure may form a flap valve over some ventricular septal defects (VSDs). The aortic valve has 3 leaflets composed of fragile cusps and the sinuses of Valsalva. 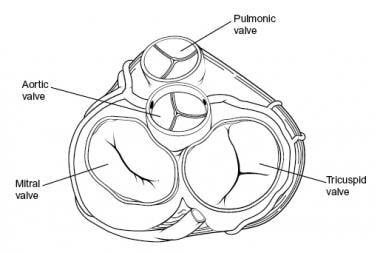 Thus, the valve apparatus is composed of 3 cuplike structures that are in continuity with the membranous septum and the mitral anterior leaflet. The free end of each cusp has a stronger consistency than the cusp. The midpoint of each free edge contains the fibrous nodulus arantii, which bisects the thin crescent-shaped lunula on either side. The aortic sinuses of Valsalva are 3 dilations of the aortic root that arise from the 3 closing cusps of the aortic valve. The right and left sinuses give rise to the right and left coronary arteries; the noncoronary sinus has no coronary artery. The sinus of Valsalva walls are much thinner than the aortic wall, which is a factor of surgical significance; therefore, aortotomies are typically performed away from this region. The aortic annulus is situated anteriorly to the mitral valve annulus and the anterior leaflet of the mitral valve. The cranial portion of the left atrium is interposed between the aortic and mitral valves. Anteriorly, the aortic annulus is related to the ventricular septum and right ventricular outflow tract. The His bundle courses beneath the right and noncoronary aortic valve cusps of the membranous ventricular septum. Thus, incision of the aortic annulus or septal myocardium anterior to the right coronary sinus should not interfere with the conduction system. The 2 main coronary arteries are the right and left. However, from a surgical standpoint, 4 main arteries are named: the left main, the left anterior descending, and the left circumflex (LCX) arteries (which are all branches of the left coronary artery) and the right coronary artery (RCA). The RCA and LCXs form a circle around the AV sulci. The left anterior descending and posterior descending arteries form a loop at right angles to this circle; these arteries feed the ventricular septum. The LCX gives off several parallel, obtuse, marginal arteries that supply the posterior left ventricle. The diagonal branches of the left anterior descending artery supply the anterior portion of the left ventricle. The term dominance is used to refer to the origin of the posterior descending artery (PDA). When the PDA is formed from the terminal branch of the RCA (>85% of patients), it is termed a right-dominant heart. A left-dominant heart receives its PDA blood supply from a left coronary branch, usually the LCX. This is often referred to as a left posterolateral (LPL) branch. The left main coronary artery (LCA) originates from the ostium of the left sinus of Valsalva. The LCA, which courses between the left atrial appendage and the pulmonary artery, typically is 1-2 cm in length. When it reaches the left AV groove, the LCA bifurcates into the left anterior descending (LAD) and the LCX branches. 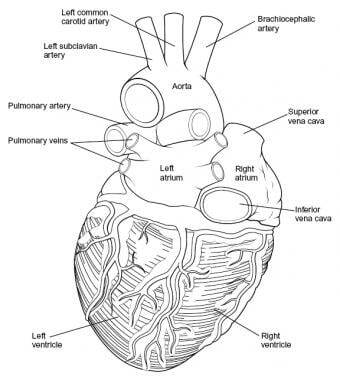 The LCA supplies most of the left atrium, left ventricle, interventricular septum, and AV bundles. The LCA arises from the left aortic sinus and courses between the left auricle and the pulmonary trunk to reach the coronary groove. After originating from the left main artery, the LAD artery runs along the anterior interventricular sulcus and supplies the apical portion of both ventricles. The LAD artery is mostly epicardial but can be intramuscular in places. An important identifying characteristic of the LAD artery during angiography is the identification of 4-6 perpendicular septal branches. These branches, approximately 7.5 cm in length, supply the interventricular septum. The first branch of the LAD artery is termed the ramus intermedius. In fewer than 1% of patients, the LCA is absent, and the LAD and LCX arteries originate from the aorta via 2 separate ostia. As the LAD artery passes along the anterior interventricular groove toward the apex, it turns sharply to anastomose with the posterior interventricular branch of the RCA. As the LAD artery courses anteriorly along the ventricular septum, it sends off diagonal branches to the lateral wall of the left ventricle. Congenital LAD artery variations may include its duplication as 2 parallel arteries (4% incidence) and length variations (premature or delayed distal termination). The LCA gives off the LCX artery at a right angle near the base of the left atrial appendage. The LCX artery courses in the coronary groove around the left border of the heart to the posterior surface of the heart to anastomose to the end of the RCA. In the AV groove, the LCX artery lies close to the annulus of the mitral valve. The atrial circumflex artery, the first branch off the LCX artery, supplies the left atrium. The LCX artery gives off an obtuse marginal (OM) branch at the left border of the heart near the base of the left atrial appendage to supply the posterolateral surface of the left ventricle. The color contrast between the yellow-orange OM and the adjacent red-brown myocardium may be the most reliable way to identify this artery intraoperatively. In patients with a left-dominant heart, the LCX artery supplies the PDA. Many variations in the origin and length of the LCX artery are noted. In fewer than 40% of patients, the sinus node artery may originate from the LCX artery. The RCA is a single large artery that courses along the right AV groove. The RCA supplies the right atrium, right ventricle, interventricular septum, and the SA and AV nodes. The RCA arises from the right aortic sinus and courses in the coronary (AV) groove between the right auricle and the right ventricle. In 60% of patients, the first branch of the RCA is the sinus node artery. As the RCA passes toward the inferior border of the heart, it gives off a right marginal branch that supplies the apex of the heart. After this branching, the RCA turns left to enter the posterior interventricular groove to give off the PDA, which supplies both ventricles. The AV node artery arises from the "U-turn" of the RCA at the crux (ie, the junction of the AV septum with the AV groove). At this point, the PDA feeds the septal, right ventricular, and left ventricular branches. The PDA courses over the ventricular septum on the diaphragmatic surface of the heart. Unlike the septal branches off the LAD artery, the septal branches from the RCA typically are short (< 1.5 cm). Terminal branches of the RCA supply the posteromedial papillary muscle of the left ventricle. (The LAD artery supplies the anterolateral papillary muscle of the right ventricle.) Near the apex, the PDA anastomoses with the anterior interventricular branch of the LCA. The coronary sinus is a short (approximately 2 cm) and wide venous channel that runs from left to right in the posterior portion of the coronary groove. The opening of the coronary sinus is located between the right AV orifice and the inferior vena cava orifice. The coronary sinus drains all venous blood from the heart except the blood carried from the anterior cardiac veins. The coronary sinus receives outflow from the great cardiac vein on the left and from the middle and small cardiac veins on the right. The great cardiac vein is the main tributary of the coronary sinus and drains areas of the heart supplied by the LCA. It begins at the apex of the heart, ascends in the anterior interventricular groove with the LAD artery, and enters the left end of the coronary sinus. The middle and small cardiac veins drain most of the heart supplied by the RCA. The middle cardiac vein begins at the apex, ascends in the posterior interventricular groove with the posterior interventricular artery, and empties into the right side of the coronary sinus. The small cardiac vein runs in the coronary groove along with the marginal branch of the RCA; this vein usually empties into the coronary sinus but may empty directly into the right atrium. Coronary veins of the right ventricle drain directly into the right atrium; thebesian veins drain into the right ventricle. The left ventricle venous return drains into the coronary sinus located next to the septal portion of the tricuspid valve annulus. Pick T, Howden R. The heart. Gray's Anatomy: Descriptive and Surgical. Philadelphia, PA: Running Press; 1974. 460-73. Saffitz JE. Connexins, conduction, and atrial fibrillation. N Engl J Med. 2006 Jun 22. 354(25):2712-4. [Medline]. Seemann G, Hoper C, Sachse FB, et al. Heterogeneous three-dimensional anatomical and electrophysiological model of human atria. Philos Transact A Math Phys Eng Sci. 2006 Jun 15. 364(1843):1465-81. [Medline]. Gollob MH, Jones DL, Krahn AD, et al. Somatic mutations in the connexin 40 gene (GJA5) in atrial fibrillation. N Engl J Med. 2006 Jun 22. 354(25):2677-88. [Medline].